Mike Davis' gifts for running the football are such that coach Steve Spurrier has said he expects his junior running back to enter the NFL after this season. While Davis' raw power and speed might not be on a level with Georgia's Todd Gurley, he has more quickness than Gurley and can make tacklers miss more effectively. He's added some size in the offseason, up to 225 pounds, and figures to be the centerpiece of a South Carolina offense that will feature a dominant offensive line with a new starter at quarterback. An injury-free season is all he'll need to post back-to-back 1,000-yard seasons. If nothing else, the panel was consistent in their votes for Davis. Three placed him 15th on their top-20 lists, another 13th, and three didn't rank him at all. Where do fans rank Davis? We asked Twitter and Facebook users who they considered the best player in college football. Davis did not receive any votes among the more than 19,000 responses. That's not surprising since his name does not resonate nationally, and he was overshadowed by teammate Jadeveon Clowney last year. 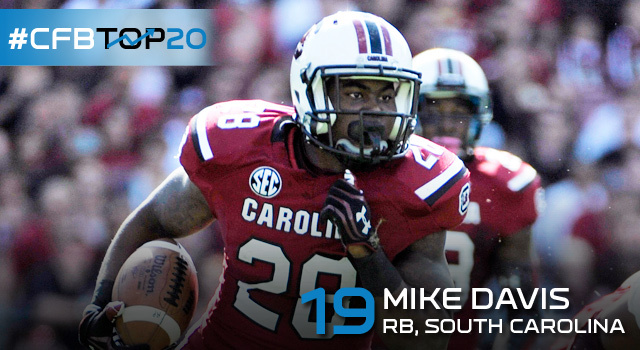 A big year, which many expect to be his last at South Carolina, should change things.